ON SATURDAY evening I finally made it to one of the Ollie Jennings-run Druid Sessions in the Mick Lally Theatre which have been proving a big hit with gig-goers over the past few months. This was the fifth gig in the series and featured Padraig Stevens with Leo Moran. The evening kicked off with a very enjoyable set from Vickers Vimy who delivered a selection from their own fine recent album, Atlas Of Hearts. ‘Bonfire of Dantes’, ‘Chicago’, ‘Budapest’, and ‘Mermaid of Luna Park’ were among the engagingly ‘ear-wormy’ tracks with which they regaled the attentive and appreciative audience. That attentiveness and appreciativeness is greatly aided by the setting of the Druid sessions, in the intimate, compact, Mick Lally theatre. It definitely enhances the pleasure of listening to the music where one does not have to contend with the hubbub of people to-and-froing from a bar or interacting with their phones – distractions which can undermine so many gig experiences these days. There was a big and warm welcome from the audience for Padraig and Leo when they entered, Padraig kicking off his set with the aptly-chosen ‘I’ve Got A Gig Tonight’ which humorously evoked the joys and travails of his days as a struggling musician in London many moons ago. While treating us to tracks from his current album, News From The Old Country. Padraig also delivered a selection of great Galway-themed songs. ‘Follow Me Down to Galway’ is an anthem-in-waiting, and two other gems were a funny riposte to Richard Thompson’s ‘From Galway to Graceland’, which told the story from the viewpoint of the heartbroken lover left behind by the female pilgrim, and another song about Galway’s atrocious traffic issues. Alongside the songs Padraig shared the stories behind them which further added to the evening’s many pleasures. 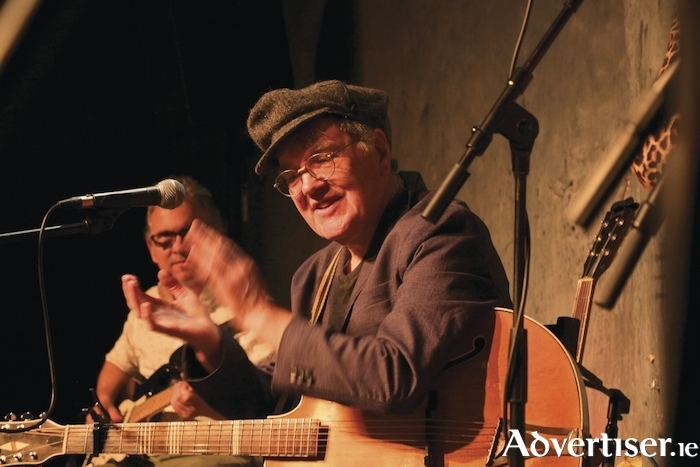 Leo Moran was his dependable wingman throughout with tasty riffs and licks and further sterling support was offered by guest performers Pauline Scanlon and The Whileaways whose vocals enriched many of the songs. Memorable highlights chosen from the new album included ‘Sonny Curley’s Bus’ ‘A Prayer to St Anthony’, ‘Deeper into Blue’, the harrowing ‘We Stood Aside in Silence’, the rapturous description of starlings in flight ‘The Murmuring’, the poignant ‘Lull’ and the earthy ‘We Grow Potatoes’ (“You can boil them or bake them /Make chips, kids'll ate them” ). Padraig also played ‘Let it Fall’, his tribute to Tony Small which begins, "The sound of a voice and the sacrament of song/Let it Fall Let it Fall Let it Fall/Celebrate some thing we've known all along/Let it Fall Let it Fall Let it Fall” – lines that could also be applied to Padraig and his luminous, affirming, art. The next Druid Session will be on Friday December 7 and will be an all-star traditional Irish gig in honour of Mary McPartlan.